This objective ofthis penalty kill forecheck is to create a turnover before the opponents can gain the red line. The execution of timing and angles is key. Once the puck is cleared down the ice the penalty killers will set up outside the blue line as shown in the animation. The two forwards will set up on the outside of the ice with the two defense on the inside. Each player has a critical role and is explained below. The first penalty killer (k1) swings through the high slot. Their goal is to force the puck carrier to pass to the strong side of the ice where the defense will be anticipating the pass. They have to use their stick and angle to prevent any pass from going to the side where they started. This player will have a lot of speed going back to their own net so if the opponents are able to dump the puck, this player can often win the race to the loose puck. 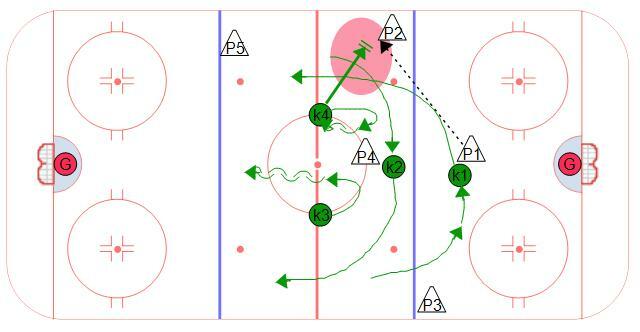 The other forward (k2) will swind behind k1 in the opposite direction and cause problems if a pass is made to the middle of the ice. If the puck carrier is able to make a pass to the weak side, then k2 applies pressure. The strong side defense in this case is the side in where you want the puck to go. In this case it is k4. Their job is to disguise the pressure they will apply once the pass is made to the strong side. The other defense will play the safety role and back up in the middle of the ice to prevent any stretch passes.